As promised, an exciting photo of gravel! This is 8 cu.yds. delivered for $300. That's a lot of money. 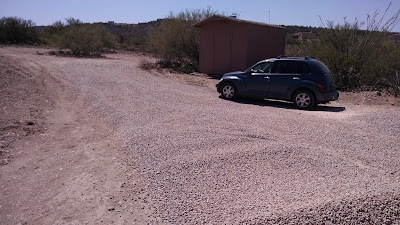 I wish I could afford more gravel for the whole driveway but I will have to be happy with enough for the parking area. The monsoon rains started today. I hope my gravel isn't washing away. I should be out there looking for leaks in the mobile home but instead I am in my house hanging out with my dogs. Maybe I can get enough done on Saturday so that I can spend the night there next weekend. I am dog-sitting two dogs this week so that throws a wrench in things. I wasn't expecting it to rain yet. I thought I had at least another week or two. The manager of Home Depot called me about my short vinyl complaint. She said she would give me a replacement piece at a discounted price. We will see if that actually works out since she doesn't work until after 3 on Saturday and I plan to pick up the vinyl in the morning. Besides buying the last 2 sheets of vinyl flooring, I plan to focus on fixing any leaks around the new window, door and dog door, and cover the water heater closet that I never covered because I still haven't finished the plumbing for the bathroom. I've just about given up on gutters. I have 3 gutter pieces but they aren't a priority at the moment even though I hate to see this rain wasted. My list of what is not going to get done is getting longer and longer. Century Link should be turning on my internet. If my modem works I will be able to bring out my TV and Roku so that I can watch movies instead of working on all of my projects....hmm...that really doesn't make much sense. Well, one of these days I will have all of the important projects completed and then I will be able to relax and watch a movie. That's my goal.